It is what it sounds like. Preserving memories of Singapore. Singapore is less than 50 years old, but so many things are already gone. Things we love, things we hate. Progress at breakneck speed will do that to you. Harried chopping and changing in a tiny island will leave in its trail disjointed peculiarities - here today, gone tomorrow. When I was in Saga-ken (a rural prefecture in Japan) last year, one of the locals told me, "Nothing ever changes here." Saga is beautiful and charming in a timeless way, but the locals sometimes feel bored. Yes, change is exciting, and it's healthy. I just wish we had the luxury of more time to enjoy what we have. Our ways of life as we know it seem even more transient, even more precious and worth noting down. Anything in or with regards to Singapore, even something that's not old or retro, can be added. Big or small, triumphant or trivial - immortalise it all in the form of texts, images, audio or video files. Instagram or Twitter users use the hashtag #sgmemory to help create awareness of this project. Last Saturday, a group of us food bloggers went around Singapore on a #sgmemory food trail of some of of the older "makan" eateries. Daniel was our "tour guide" and he did a great job; I discovered quite a few new things. One of the things we hope will never disappear - a good teh tarik (mine's with halia/ginger)! Zam Zam is more than 100 years old; it was set up in 1908. Service is brusque at best, but the place is still packed. Come upstairs for some air-conditioning. Look at these stamped metal cutlery pieces. frustrated attempts at cutting anything tough (ever bent one of these?). Of course, Zam Zam is most famous for its murtabak (mutton, chicken, deer). Skip the briyani and save the calories for this. Oh the heavenly Pandan Kaya Swiss Roll. So fluffy and soft, it feels like biting into a cloud. One of the signature items at Rich and Good Cake Shop. You'd be all smiles too, if you had some of these Swiss Rolls. This is the Mango version, filled with cubes of the tart fruit and extra cream. I prefer the kaya one though, and I hear the durian one is great too. This shop has been around since the 1970s. Next up - a feast of Foochow delicacies! no-frills, non-air-conditioned joint in a refurbished shophouse in the Arab Street area. Foochow fishballs famously have a mince pork filling. feel the difference in the soft yet chewy texture. Red wine lees chicken with mee sua - a fortifying meal. Thankfully the wine flavour is not too strong here, unlike confinement versions. hammering pork with sweet potato flour until it becomes a skin. This old school bakery from 1975 is a treasure trove of Nonya kuehs, pastries and cakes. Key highlight and discovery here - the Kueh Dadar. These carry a filling of shredded coconut without the usual gula melaka! It's a refreshing take, which I really like. The lemper udang (bottom) and lemper ayam (top) are both delicious savoury items. they look similar but the latter has a bouncy, chewy texture! Love it. Very haute ok, this kueh. So pretty. Coconut candy. There's no resisting these! These are made with cranberries to cut through the sweetness. The bakery also supplies incredible milk buns to Shashlik Restaurant. If you're lucky, they may have extra to sell at the restaurant. Remember these? Flaky, buttery and sweet - these are called butterfly horseshoes. Stuff was so good, we couldn't resist buying some back for our families. It's the library's birthday soon too. Guess how old it is? This is the oldest library in Singapore. showcasing memories of Queenstown and its environs. You can share your stories too. Fill up the postcards and drop them into the Carnation-style "Collection" tins. There are lots more suggested activities here. Come take a look. You can also browse the many stories and recollections. I learned quite a few things I never knew. that the richness of the past can live on. 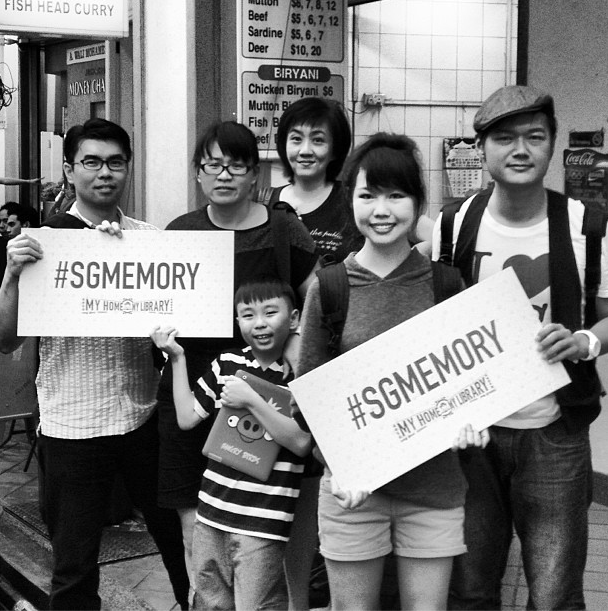 So get snapping and posting with #sgmemory. The "My Home, My Library" exhibition at public libraries island wide is on from now till 29 April.